Discussion in 'Dell' started by Aaron44126, Jan 21, 2019. A command-line app that allows you to take over fan control in many Dell laptop/notebook computers. This project uses the SMM I/O driver developer by 424778940z and is derived from the "Dell fan utility" GUI app, also by 424778940z. Note: I am interesting in offsetting the cost of the certificate used to sign the driver, which was $75. I have already received donations, and the remaining amount is $25. I will remove this line once the cost has been offset. If you have found this tool helpful and would like to consider chipping in a few bucks, send me a PM. Thanks to @MikeR_Va and @maffle for contributions so far. This tool basically just allows you to tell the EC (embedded controller) in the laptop to let go of fan control. Once this is done, a tool like SpeedFan or Hwinfo64 can be used to control the laptop fans. You can set up your own temperature thresholds for fan behavior based on your own preferences. Note that without the EC controlling the fans, only three fan levels are available, which I will call "0%", "50%", and "100%". Some systems have more granular fan control while the EC is in charge, but you cannot change the behavior other than picking a thermal profile in Dell Power Manager. Also note that the fans' actual maximum speed may be higher than what you get if you set the speed to "100%". For example, in the Precision 7530, setting the speed to "100%" puts the fans at 4200 RPM, but if the EC is in charge of the fans and the system is under load it may push the fans up to 4800 RPM. We have confirmation that this method works with these systems. (Add yours in a comment below and I will add it to this list.) I think that it is highly likely to work with any system closely related to these. You must reboot your system before the change will take effect. Note that this creates a minor security risk. This will allow any signed driver to be loaded, even if it does not have an EV certificate from Microsoft. Note that Microsoft did not start requiring EV certificates until Windows 10 1607 ("Anniversary Update") in mid 2016. Once this is taken care of, you can pass one of these options to DellFanCmd to tell it what you would like it to do. This will tell the EC to let go of fan control and set the fans to run at "100%" (until your fan management tool takes over). You should immediately be able to control the fans with SpeedFan at this point. This will tell the EC to take over fan control again. Note: DellFanCmd.exe must be run elevated / "as administrator". The purpose and behavior of the "alternate method" is unknown to me but it might help if you find that the "regular" method does not work. The projects linked above have reference to it so I kept it in. When you disable EC control of the fans, this appears to stick past reboots (unless you go into the BIOS setup and make a change). To restore everything back to the original state, you must fully shut down the system. The key thing to realize here is that even though you can adjust the PWM on a spectrum from 0% to 100%, the fan will actually only run at one of three speeds ("0%", "50%", and "100%"). So setting up a nice graceful fan curve won't benefit you at all. What you need to do is decide at which temperature levels you would like the fan to run at which of the three speeds. Go to "Configure" and then "Options" and then "Enable DELL support". Hit "OK" and then fully exit and restart the program. You should now be able to see the current fan level on the main screen, and even adjust the fans by changing the Pwm values on the main screen. Click "Configure" again. On the "Temperatures" tab, uncheck any temperatures that you are not interested in. For the remaining ones, click them and change the "warning" temperature to be very high (90 or 100 °C). The reason for this is, once automatic fan control is turned on, it will automatically set all of the fans to 100% if any of the "warning" thresholds are hit, regardless of the fan configuration that you have set up. Go to the "Fan Control" tab and check the box for "Advanced fan control". Then, add a fan controller. You will want one fan controller for each fan and you can name them appropriately. I first set this up on the Precision M6700, which has one fan clearly intended to be the CPU fan and the other clearly intended to be the GPU fan, so I named the controllers accordingly. For each controller, make sure to check the "Controlled speed" box (or it will do nothing) and then select which fan you would like it to control from the drop-down. Set the "Method" to "MAX of speeds" and not "SUM of speeds". "Hysteresis" is a second threshold to prevent the fans from constantly changing speeds if the temperature is right around a threshold. Basically, with this configuration, the fans will go to "100%" if a CPU core reaches 85 °C, and then it won't go back down to "50%" until the temperature drops to 70 °C (a drop of 15 °C). Once you have everything set up, you can go back to the main window and check the "Automatic fan speed" checkbox, and SpeedFan should take over fan control according to the options that you have set. You can make further changes under "Advanced fan control" and they will be applied as soon as you hit "OK". I recommend checking the "Minimize on close" option under the Options tab in "Configure", so that SpeedFan will just run in the tray after you close it and do its job in the background. When you log into Windows, SpeedFan should fire automatically, and then the EC should be asked to let go of fan control so that SpeedFan can manage it. This should persist for your whole session. If you log out or reboot the system, fan control should go back to the EC because SpeedFan won't be managing the fans anymore. I set up three tasks in Task Scheduler for this. 1. Disable EC fan control at login. I made a task with "At log on" of "specific user" (myself). It runs this script. START "" /B "C:\Program Files (x86)\SpeedFan\speedfan.exe"
This basically starts SpeedFan, waits 75 seconds (plenty of time for it to load all of the sensors and get ready to go), and then disables EC fan control. SpeedFan takes over right away. I have SpeedFan configured to start minimized. The "pause" command just adds a "press any key to continue" prompt before the command window goes away. 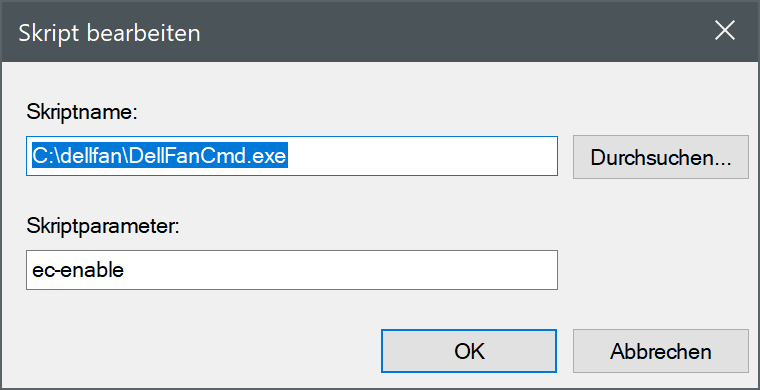 So, I can see the output of DellFanCmd before it automatically disappears. 2. Disable EC fan upon resume from hibernate. 3. Return fan control to the EC upon logout. The trickiest one. There's no clear event to trigger off of for logout. Also, I want to make sure that it is only when *I* log out and not other users (I'm not the only one who uses my laptop). This captures a logout event entered by Microsoft's Windows telemetry service. The Data='S.....' is my Windows account SID. You'll have to adjust it for your own SID. I also added this to the "Shutdown script" (gpedit → Windows settings → Scripts) because the scheduled task will (sometimes?) fail when the system is shutting down or rebooting. When setting up scheduled tasks, pay attention to the option that is enabled by default which prevents them from running if the system is on battery power. All tasks need to be set to run with "highest privileges". That is all. Let me know how it works for you, and let me know if you have any suggestions/tips and I may integrate them into this post. dasdemolisherduck, haceru, Atom Ant and 8 others like this. Very neat, thanks for sharing! This BSoD'ed my M6500 with 0x07e and something related to the fan control driver. I did have HWiNFO's fan control open however. EDIT: Even without HWiNFO open it BSoD's my Precision if I do ec-disable. I haven't experienced any BSOD while working on this. Will these always be executed as admin? https://i.imgur.com/SIRTvMU.png so that is enough? REM Make sure that we are in the right place. REM Hand fan control back to the EC. Thank you for this, I will try this out on the Precision one of these days. This has also been confirmed occurring on a 9360. I don't have any XPS machines so I can't even begin to investigate. Though, it seems that the EC must be involved in brightness control and disabling EC fan control also disables this feature. Not sure if trying the "alternate" method would help? It's a hassle but I understand that you can get brightness control back by simply rebooting. EC fan control will remain disabled. Is it safe to format an SSD through Windows 10 Media Toolkit during boot?